We had purchased the one acre lot in Eden Prairie while living in Richfield, and before moving to Nebraska. The lot was on the market while in Nebraska, but was not sold. We determined the proper thing to do when returning to Minnesota was build our family home on the property. A Sussel "Near-bilt" home was decided upon which advertised to the effect they'd do the difficult outside, and we'd do the easy inside of the house. We were also responsible for the general contracting related to building permits, excavating, foundation construction, and utilities. 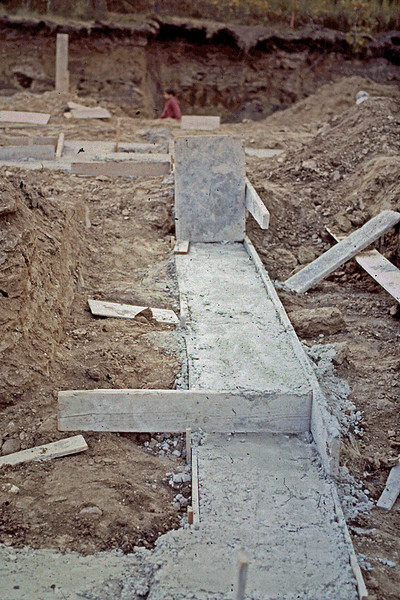 These photos are scanned from 35-mm slides and are not the best quality, but show the stages of construction of our new abode.